How to create Handbrake preset settings for iPad/Pro/Air/Mini? iPad is popular with many people around the world. HandBrake is widely accepted to convert DVDs or videos for iPhone, iPad, etc. But in most cases, the iPad profile can not address iPad users' needs. So, this article will show you how to do the handbrake preset for ipad and also indroduce the best HandBrake alternative DVD ripper software for those guys fed up with completed HandBrake settings. The iPad is a tablet computer designed and developed by Apple. It is particularly marketed as a platform for the use of audio and visual media. iPad is a perfect portable device to play back videos. However, it cannot play all types of videos and DVDs, unless you use a converter like HandBrake to convert them to iPad playable formats. iPad supported videos include: H.264 video, 30 frames per second, Main Profile level 3.1 with AAC-LC audio up to 160 Kbps, 48kHz, stereo audio in .m4v, .mp4, and .mov file formats; MPEG-4 video, up to 2.5 Mbps, 30 frames per second, Simple Profile with AAC-LC audio up to 160 Kbps, 48kHz, stereo audio in .m4v, .mp4, and .mov file formats. Best DVD ripping software fully compatible with Windows 10/8/7/Vista/XP OS, enables you to decrypt and rip any protected DVD to MP4, AVI, WMV, MOV, etc. at one go. Newest version HandBrake 1.0.7 is available to download now. Since 0.9.4, HandBrake has a much improved compilation system, which allows easy 64-bit builds. 64-bit builds tend to perform approximately 10% better than their 32-bit. Though it added more than 1000 features, since released on Nov 23, 2009 (iPad was published on middle of next year), there was no HandBrake preset for specific iPad model (same as there is no handbrake preset for iPhone X/8/). Since Apple has strict video encoding guidelines for its devices, like iPod, iPhone, as well as iPad, you can not convert a video onto iPad until add iPad preset settings into HandBrake. This article pays close attention about How to Create Handbrake iPad Preset Settings to Convert Video and DVD to Apple iPad? Step 1: Open HandBrake folder: Hit Win+R, then paste %appdata%\Handbrake, and you will see two preset files in the folder: handbrake_presets.xml and user_presets.xml. Single click Mouse Right and open user_presets.xml with notepad. Step 2: Delete all original content and replace the tags below, then save and close notepad. Step 3: reopen HandBrake, and you'll check the handbrake iPad preset in its Presets Windows. Now you can convert DVD/HD Videos onto iPad using HandBrake iPad preset. However, comparing with GUI (Graphical User Interface), machine language is much harder to understand and handle with (it is quite normal to encounter with unexpected crashing and breakdowns). Besides, rather than grabbling around to find the HandBrake preset settings for iPad (though you can download them anywhere, it must be a time-consuming labor), why don't you directly find a HandBrake alternative for converting your DVD/HD Videos onto iPad, iPhone, PSP, Xbox, etc? This tool is popular HandBrake alternative software, which is especially designed for HD video conversion. It perfectly makes up the codecs lack of Handbrake (MPEG-4 video file or MKV and no more). 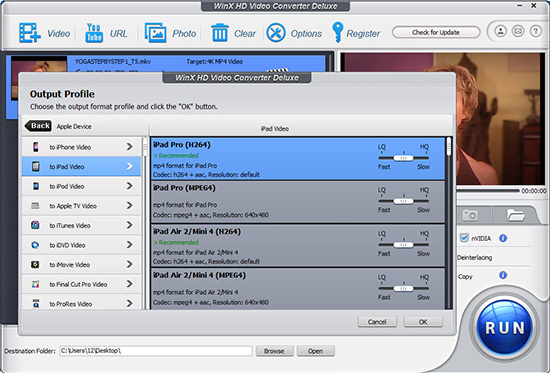 Buit-in more than 410+ preset profiles, WinX HD Video Converter will satisfy all you video conversion needs. It enables users to convert videos to iPad Pro, iPad Air 3/2, iPad mini 5/4/3 and more iPad models directly without complicated iPad presetting happening to HandBrake. It is really time-saving and easy-to-use for anyone including the beginners without technical skills. It is the best recommended HandBrake alternative for converting DVD to iPad. There are innumerous advantages that surpass HandBrake anyway, like directly convert DVDs to iPad Air 3/2, iPad mini 5/4/3, etc ; makes perfect 1:1 copy (disc to disk) with 5 minutes, constantly update to support latest DVD copy protections, especially DVDs released by Sony and Disney, which embarrassed HandBrake so long (learn to rip copy protected DVDs with HandBrake VLC 64 bit), support Handbrake unsupported videos and devices, like AVI, Xvid, PS3, Xbox. 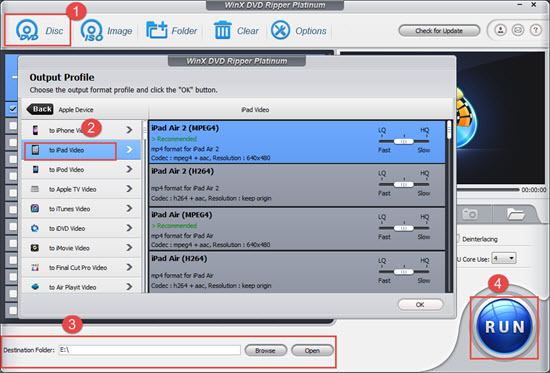 To sum up, rather than complaining HandBrake limited (iPad) presettings, buggy issues or slowly update, you'd better get the HandBrake alternative for DVD/Video to iPad conversion, like WinX HD Video Converter Deluxe and WinX DVD Ripper Platinum. They never bring inconveniences. You don't need to add Handbrake preset for ipad manually. And it keeps updating to support the newest DVDs and new iPad, iPhone, Android devices. If you're enough for the annoying iTunes for iPad file syncing, you'd are recommended to try WinX MediaTrans (iOS 11 supported). It's much easier to handle than iTunes, and faster in video transferring speed than other mobile manager software. Both Windows (10) PC and Mac OS X versions are provided here, download what you need. Easily rip any DVD (incl. copy-protected DVD) to MP4, AVI, WMV, MKV, MOV, FLV, H.264, MPEG, iPhone X/8/7/7 Plus, 6S/6S Plus, Samsung Galaxy S8/S7/S7 Edge and many more by supporting all DVD protections, and generate a perfect intact digital copy of the DVD movie at fastest speed.